There is a huge range of ways to travel throughout Western Australia: by car, bus, plane, train, bicycle, with a caravan – the possibilities are extensive! However, one of the most exciting and talked about ways of travelling is the helicopter safari, where your own private helicopter takes you to some of the most stunning locations in Australia. Alongside a highly experienced and knowledgeable pilot, HeliSpirit’s helicopter safari offers the chance to create an itinerary completely suited to your wishes, and is one of the most stylish and unique ways to travel. 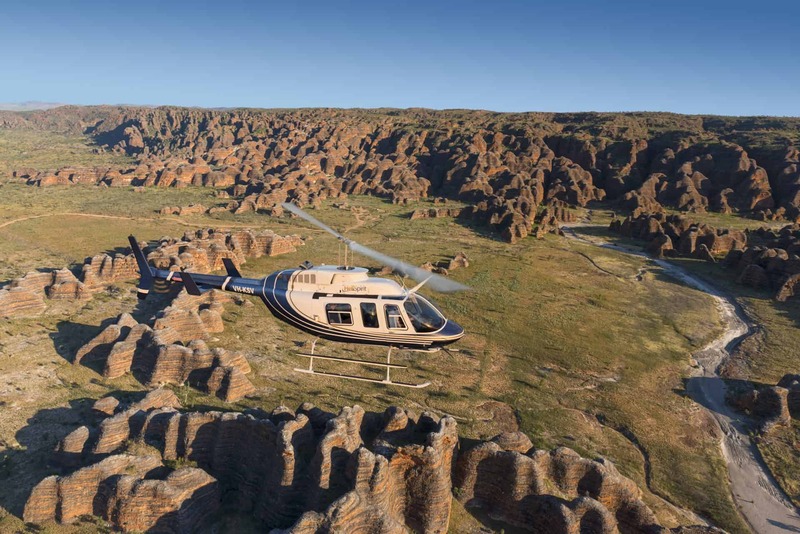 Lasting for six days and six nights, the Luxury Kimberley Helicopter Safari is an unforgettable adventure, where you can explore the stunning Kimberley wilderness alongside a small group of friends and/or family. This safari will see you enjoying views of the huge expanse of extraordinary Kimberley landscapes from the comfort of your own private helicopter. Having your own helicopter allows you to land on a mountain pinnacle to watch the sunset over your favourite cold drink, fish in wild rivers, view galleries of the oldest rock art on earth, soar through gorges and touch down to swim in secret springs and waterfalls. Due to the remoteness and rugged nature of the Kimberley landscape, there are many stunning locations only accessible by helicopter. On the safari, the whole Kimberley truly is at your fingertips, and you will see views and walk on ground that few others have visited before you. Across the six nights, you will stay in a selection of incredible Kimberley accommodation: The Berkeley River Lodge, Kimberley Coastal Camp and El Questro Homestead – all of which offer state of the art hospitality, dining and lodging. These sanctuaries are the ideal place to rest and recover each night before another full day of adventuring and sight seeing. There is also a range of activities available at these lodges, including horse back riding, fishing, bushwalking and boating. Before your safari commences, you will stay at the beautiful Freshwater Apartments located in Kununurra, where you can swim in the tropical pool or relax in air conditioned serviced apartments. The helicopter safari can also be tailored to suit a family (typically two adults and two children aged under 16 years old). On the family safari, you will stay at the fantastic tented accommodation at Emma Gorge rather than the El Questro Homestead, as the homestead only accommodates guests aged 16 years or older. The helicopters used for the air safaris are turbine engine driven, beautifully maintained and supported by the world class maintenance engineers at HeliSpirit’s Kununurra facility. They feature large windows, meaning that you can take in the stunning views from all angles. As these air safaris are private, you are able to choose a departure date that suits you. April and May are the most popular months to visit the Kimberley, with mild weather, but plenty of water around after the wet season, meaning that waterfalls are still flowing. This safari truly is the most incredible way to experience the Kimberley, and it is guaranteed that travellers will be blown away by what the Kimberley has to offer. Let us help plan your Kimberley experience, our knowledge and passion will ensure your Kimberley itinerary delivers all you aspire to. Call the Kimberley Experiences team on 1300 456 345 or send us an enquiry.